Savvy gardeners soon learn to abhor invasive species. These plants set up housekeeping in a new environment and, like a vegetable version of the Mongol hordes, soon drive out or kill any species that might somehow compete with them. Invasive plants are non-native species that were often first imported as ornamental plants, and sometimes accidentally brought from an exotic location. Whether pretty or not, invasive plants aggressively take over large areas of habitat, usually because none of their natural enemies and predators were imported at the same time. Invasive species aren’t all plants: though native to southernmost Texas, the nine-banded armadillo is now found throughout the southeastern US. All armadillos in Florida and adjacent states are all believed to have descended from escaped pets and zoo specimens that flourish in the absence of natural predators such as the wolf and coyote. Here are ten of the most common invasive plant species found around the United States. 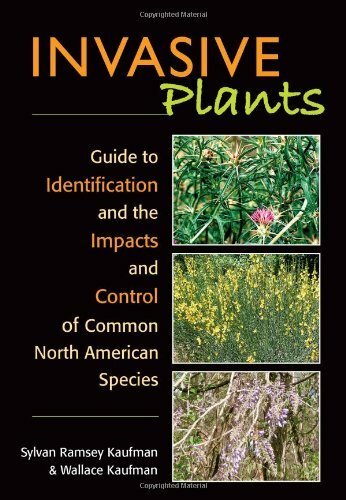 Gardeners, you can do your part to control invasive species by learning to identify the invaders from your state and local natural resources department, master gardeners, and other resources. The Cajeput tree (Melaleuca quinquenervia) is a native to Australia that was imported to the U S in the early 20th century as an ornamental plant. In the wetlands of south Florida and Louisiana, the Cajeput (also known as paperbark, bottlebrush tree or broadleaf teatree) grows wild, crowding out native species. A combination of rapid growth and a lack of natural enemies allows the Cajeput to displace native species, which reduces the food supply and shelter available to native plant, insect, bird and animal species. Dense stands of Cajeput trees are also a fire hazard, creating hot crown fires in environments that would otherwise be sawgrass prairie. Cogongrass or Japanese Blood Grass (Imperata cylindrica) is native to Africa or East Asia. The plant was introduced to the Gulf Coast between 1910 and 1930 as forage for livestock and to control erosion. Like other invasive species, Cogongrass forms monospecies stands that crowd out native grasses and other plants, reducing the food and shelter available to native plants, animals, and ground-nesting birds. The species is found all along the Gulf Coast from Texas to Florida, Georgia, South Carolina and Oregon. The plant displaces a wide variety of native species by forming a nearly impenetrable root and leaf mat. It is especially fast-spreading on disturbed ground. Originally native to east Asia, Japanese Honeysuckle (Lonicera japonica) was introduced to North America as an ornamental plant in 1862 in New York. As tough and aggressive as it is attractive, over the past 150 years the plant has spread like wildfire from where it was originally planted at farmsteads and in fencerows. It’s considered an invasive species in every state east of the Mississippi except Maine, Alabama, and Mississippi; and is also on the list in Kansas, Oklahoma, Texas and Hawaii. The tough, woody vines grow rapidly to as much as thirty feet long, and are capable of strangling young and even mature trees in dense stands. Surprisingly, the plant is sometimes still available as an ornamental ground cover – but where growing wild, the plant can crowd out native species by creating a dense canopy that blocks light needed by understory plants. The scourge of Atlanta, Kudzu (Pueraria Montana v. lobata) was originally introduced as a ground cover for erosion control. An Asian native, the plant has overrun large sections of the southeastern US, choking growth wherever it gets a toehold. Its vines, which reach to 100 feet in length and four inches in diameter, can lengthen as much as a foot per day in growing season. Kudzu kills plants by choking them and in some cases by breaking and even uprooting trees under the weight of its dense foliage. Originally introduced as a vine for forage, erosion control and basket-making, the plant has no North American enemies. In its native habitat, Kudzu is held in check by insects and fungi that didn’t make the trip from Asia. Infestation is known in every state east of the Mississippi except the far northeast, plus the Great Plains and Oregon. Most common in the northern Great Plains and the Mountain West, Leafy Spurge (Euphorbia esula) was imported from Europe in the early nineteenth century. Research suggests that this species is an accidental invader, having arrived as a contaminant in imported seeds. It’s since spread across the entire upper tier of states from Michigan to Washington and as far south as Colorado, plus California, Virginia and North Carolina. The plant, with its showy yellow flowers, is adapted to most environments but is most invasive in dry, disturbed soil; hence its presence throughout the Mountain West. Difficult to control by hand or chemical means, Leafy Spurge may eventually be controlled by natural insect enemies imported from its native range. As suggested by its common name, mile-a-minute (Persicaria perfoliata) grows rapidly and indiscriminately, latching onto plants, rocks, and structures with the sharp, hooked barbs on its vines. Upon reaching the forest’s upper story, Mile-a-Minute spreads rapidly through the treetops. The dense cover of its large leaves blocks light to the trees beneath, leaving them weakened and subject to damage and disease. The plant was originally introduced as a contaminant to ornamentals in the late 1930s. It has since spread through southern New England and the Mid-Atlantic states, as well as establishing a foothold in the Midwest and in Oregon. Lythrum salicaria, common name Purple Loosestrife, is another European native that arrived early in the nineteenth century, possibly through seeds carried in a ship’s ballast. It’s since spread though almost all of North America except for some of the hottest states (Arizona and Florida, for instance). Purple Loosestrife grows in riparian (wet) environments, where – like most invasives – it out-competes native plants. This is a classic example of an aggressive invasive species, as it creates huge quantities of seeds that spread both by wind and water. In its native habitat, Loosestrife is kept in check by insect species that eat the flowers or bore into the seeds and destroy them. Three species of European insects are imported by the USDA in an attempt to control the plant. Russian Olive (Elaeagnus angustifolia) is neither an olive nor Russian – well, maybe it grows in Russia. This Eurasian plant is a latecomer to North America, having arrived sometime in the early 20th century for use as windbreaks and ornamentals. In the past 100 years, it’s spread to almost every state in the union and to all the Canadian provinces as well. It’s considered invasive from coast to coast and from the Gulf to the 49th parallel. Like all invasive species, Russian Olive out-competes native plants by growing quickly and across a wide variety of habitats and conditions. Where it thrives, the plant interrupts normal forest succession and places undue burden on bodies of water and local aquifers. Originally imported from Eurasia as an ornamental in the early 1800s, Tamarisk (Tamarix ramosissima) or Salt Cedar is widespread across the entire western US and several states in the Midwest and east coast. In the past two hundred years, the tree has invaded watercourses all over the desert southwest and points beyond. The plant is highly adaptable, capable of thriving across a wide range of conditions including saline and alkaline water. Besides out-competing native species in the habitats it invades, Tamarisk is also blamed for depleting water bodies, lowering water tables and destabilizing stream channels where it is most abundant. Eradication methods include manual and chemical means, plus tests of insect predators. Another widely-dispersed invader, Tree-of-Heaven (Ailanthus altissima) is definitely not heavenly. This fast-growing species can grow almost anywhere, including cracks in sidewalks and gutters. The plant is especially well-adapted to grown in urban areas, where it often damages buildings and sidewalks by forcing its way into cracks and other small spaces. Tree-of-Heaven made its way to North America in the eighteenth century and has spread far and wide. It is present in almost every state and considered invasive over much of the west, from Texas to North Dakota and to the west coast. Tree-of-Heaven’s invasive nature is in part due to its rapid growth and prolific seed production, and partially due to its ability to secrete a toxic chemical that discourages growth of other plants. The wood and sap also produce an unpleasant odor. Almost every state’s agriculture or natural resources administration can provide you a list of plants that are considered invasive in your area, as well as animals, insects and other critters. Check with the U S Department of Agriculture for nationwide information as well as links to state and other agencies. An invasive species has an unfair advantage when up against native species that come with their own checks and balances. Out-competing another plant or community of plants does more than just reduce the number of plant species: the native plants provide food and shelter for animal and insect species that have evolved in parallel with the plants, and some also act as “nursemaids” for other plant species. Invasive species almost invariably reduce biodiversity in the areas they overrun. I totally have tree-of-heaven in my yard, and never knew what it was called! Every year, I would hack the monsters down in my front slope, and the next year, they'd grow to 12-15 feet high. I finally hired someone to rip out all the stumps with a chain and pickup truck, to stop my annual weeping. Thanks for the info! Wow--impressive, informative and very well done article. 5 big stars from me and yep, a rating.